Can’t I just wear a sweater? December 18, 2011 December 17, 2014 Categories Fashion, UncategorizedLeave a Comment on Can’t I just wear a sweater? Hello everyone! Sorry it has been a while since I’ve blogged. I’ve been drowning in finals, but now they’re over. (Hallelujah. Praise the Lord) So I’m back with fashion stories and tips. Miss me? Well, Sunday morning came. And I did not feel like dressing up. At all. 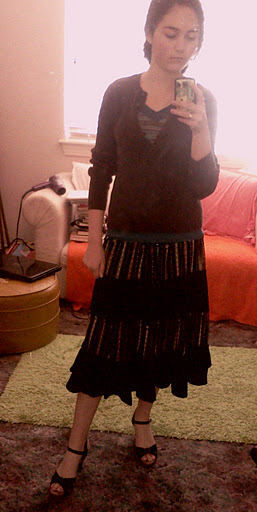 And it was cold, which took away any inspiration I had to make an outfit. I remember thinking, ugh, can’t I just wear a sweater? So that’s where I started. When I have absolutely no idea what I’m going to wear, I usually pick one article of clothing and continue from there. In this case, I picked my brown sweater first. 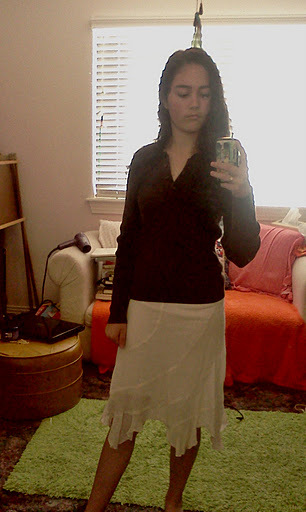 And I was going to church, so I might as well wear a skirt. 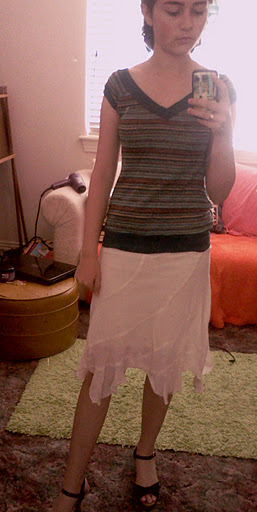 My mom gave me this thick black and brown striped flowy skirt that I just love. It fits me perfectly on the waist, and it’s really comfortable. So that’s what I tried first. off my mirror is on my to-do list. Ehhhh, it was okay, but something was missing. 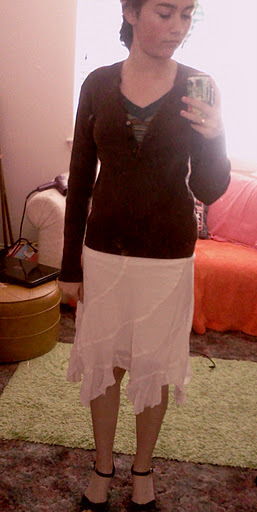 So I tried on the light tan fairy skirt I got for Christmas years ago. That definitely didn’t look good. Not only were the colors too different, but the sweater bunched up at the waist a bit, while the skirt was ever-so-slightly too small for me. Nah, not going to work. Maybe if I changed the shirt. I love this hand-me-down shirt. The color is great, it has gold thread woven in, and I love how it’s loose. My only issue with it is that it’s a total V-neck. V down the front, and V down the back. And since my shoulders aren’t wide enough to keep the V where it’s supposed to be, I’m constantly adjusting it before it slides off. Yeah, it gets annoying, but if I wasn’t going to be doing a lot of movement (i.e. sitting in a church pew) I could endure it. A sacrifice for fashion so to speak (though I honestly don’t recommend these, because you’ll usually end up torturing yourself by wearing something that’s high-maintenance and irritating, and you never know when plans change.) But even after being willing to take one for the team, I still wasn’t loving it, so I kept experimenting. 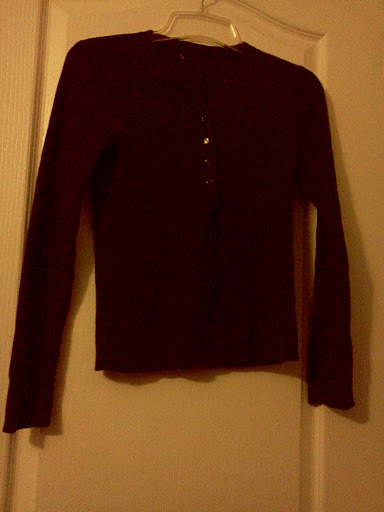 I put the sweater over the shirt and unbuttoned a few buttons down the front. Heeeey, that looked pretty good. 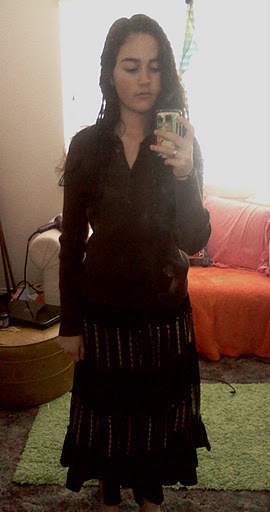 But now the skirt didn’t match again. Hah. Back to plan A. Now we were talking! 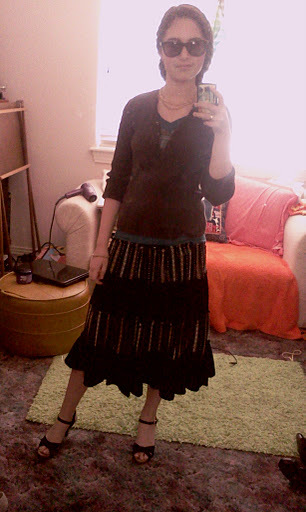 The colors worked because they were all dark and went with each other: black in skirt matched black in heels, brown in skirt matched brown in sweater, and blue shook things up a bit. I tend to add one color that’s off, but still works. What I mean is the blue was on the dark side, so it blended in with the rest. If it was a light or neon blue, it wouldn’t have gone so nicely. Make sense? And adding an off-theme color is so you don’t blend in with the wall-paper. Being all one color, unless you’re trying to make some sort of statement, tends to be boring. In my opinion. Also, I pushed up my sleeves in the picture, but I eventually rolled them up. If you ever get a chance to, guys or girls, I think it gives a nice casual, laid back appearance. Especially with collared shirts because you look businessy and easy-going at the same time. 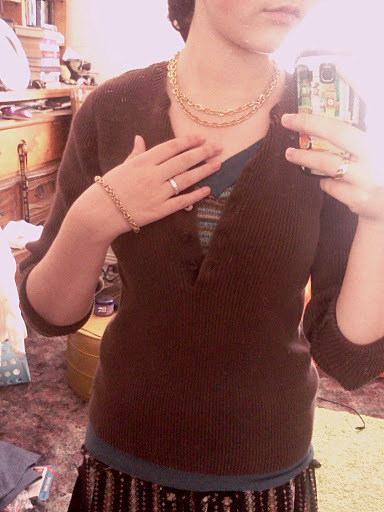 With the outfit finished, all I had to do next was pick out some jewelry. Bracelet: from Dad. Necklace: Grandma. Then I grabbed a pair of sunglasses, put on my shoes, and I was done.